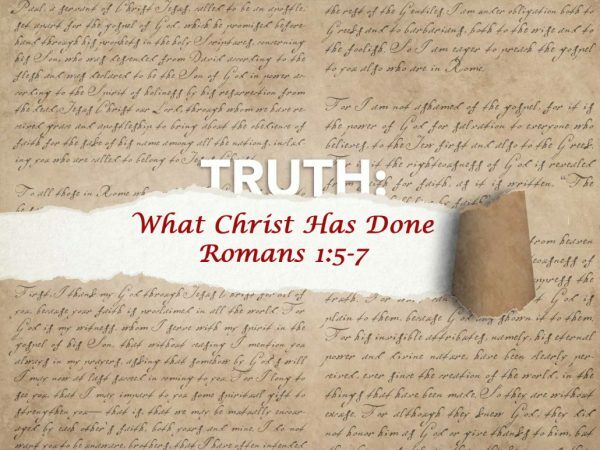 As we continue our study of Romans, we come to verses 5-7 of chapter 1. Here, Paul declares that part of the goal of the gospel is obedience. The goal of Paul’s apostleship – and ultimately the goal of the gospel message – is to produce obedience. “Obedience of faith” is a phrase meaning “a faith that produces obedience.” God desires obedience to His law. He is the Lawgiver and Creator. As such, it is His right to require, expect, and demand obedience. Too often, this requirement results in our having resentment toward God. We approach obedience as something we have to do. Faith however – that is is, believing God – generates a desire to serve Him. The result is an attitude that I want to keep His laws. My faith actually generates an attitude of servitude. It is obedience that results from my faith. Paul’s specific audience – though not exclusively – is Gentiles. Gentiles simply refers to anyone (and everyone) who is not a Jew. That is, you and me, since we are not Jewish by birth. Again, the gospel was first delivered to the Jews, even by Paul. But Paul’s specific and targeted audience are Gentiles. As such, we should be eternally grateful to have been included in God’s invitation to salvation. Ultimately, the gospel and its subsequent obedience are to bring honor and glory to God and Jesus Christ. Paul concludes his introduction in these verses and then begins in verse 8 to share the reasons behind his writing. This is the subject of this and next week’s episodes. Copyright ©2015-2019 DT Life Coach. All rights reserved. "DT Life Coach," DT script initials, and "Potential to Transform" are protected by trademark.